It’s been extremely hot and humid here! 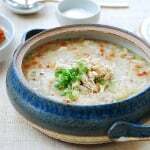 I previously mentioned the Korean idea of cooling off and boosting energy with boiling hot chicken soups, such as samgyetang (ginseng chicken soup) and dak gomtang (chicken soup). Add this dak kalguksu (닭칼국수) to the list! Kalguksu (칼국수) means “knife noodles”, but it actually refers to a steaming hot noodle soup that’s traditionally made with handmade, knife-cut noodles. There are many variations using different ingredients for the soup base or for the dough. 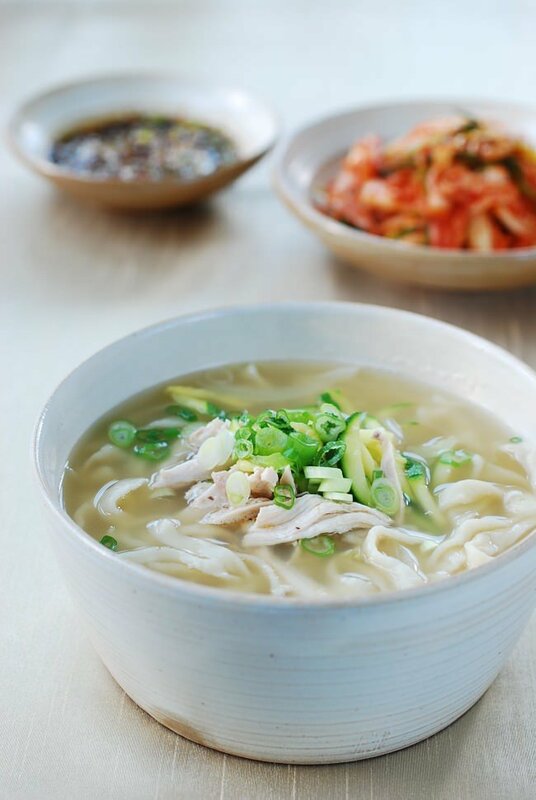 Dak (chicken) kalguksu is made with a rich chicken broth, and shredded chicken meat. You can certainly use commercially packaged fresh kalguksu noodles available in the refrigerated section of Korean markets. However, making noodles at home without a machine is not that difficult! You can make them at a moment’s notice as long as you have flour and salt! Homemade noodles taste so much better, and obviously they are much cheaper. A bit of oil makes the dough silkier and a little easier to work with, but it’s not absolutely necessary. 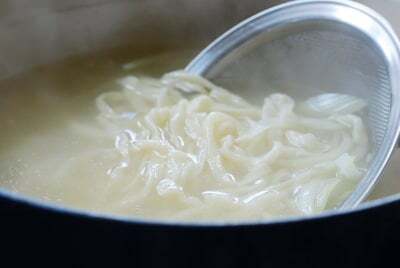 The noodles are typically parboiled in a separate pot before adding to the chicken broth. 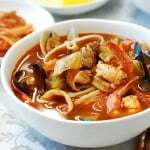 This is strongly recommended because the soup can get very thick from all the starch the noodles release while cooking. 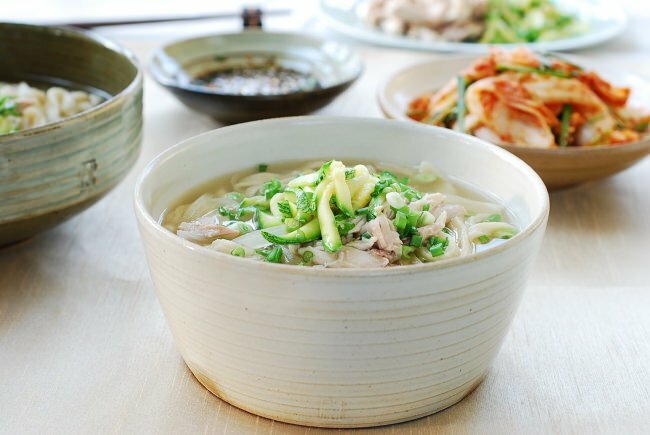 Dak kalguksu is typically made with a whole chicken. It’s a cheap way to feed more people, not to mention the stock will be more flavorful. 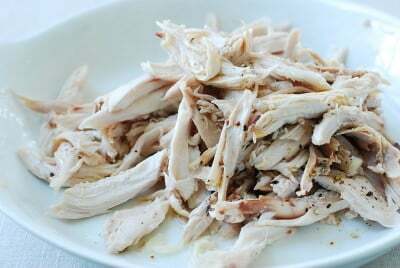 You can cut up a whole chicken before boiling if you want it to cook a little faster. If you want to use cut chicken pieces, leg quarters and chicken wings will be good for a flavorful stock. 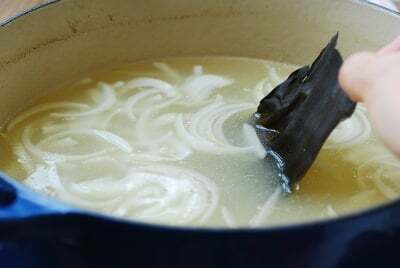 The soup is made similar to dak gomtang. 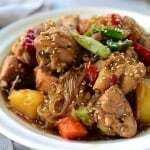 Simply boil the chicken, with some aromatic vegetables, to make a flavorful broth, and shred the meat to use as a topping. Typical kalguksu also includes julienned or sliced vegetables such as onion, zucchini, carrot, and/or potato. Kalguksu is delicious with baechu geotjeori (fresh kimchi)! 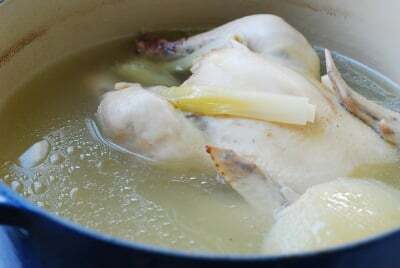 Place the cleaned chicken in a stockpot large enough to hold the chicken and 12 cups of water. Add the onion, garlic, ginger, scallions, and 12 cups water. Bring it to a boil over medium high heat. Skim off any foam on top. Reduce the heat to medium low and simmer, covered, for about 40 minutes. Adjust cooking time for cut pieces of chicken. 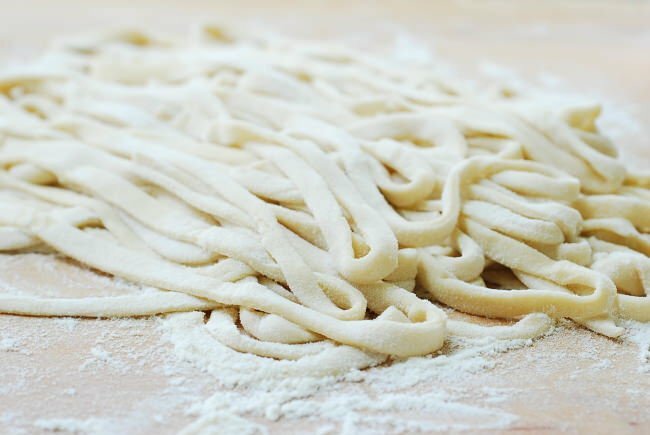 If making homemade noodles, this is a good time to start making the dough. 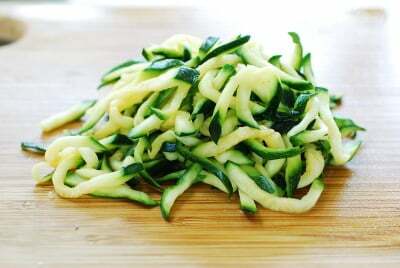 Sprinkle the julienned zucchini with salt for about 15 minutes and then squeeze out the water. Briefly saute in a heated pan with a little bit of oil. Set aside. Cut through the thickest part of the breast, with a knife, to see if the chicken is cooked and tender. Turn the heat off and carefully remove the chicken. When the chicken is cool enough to handle, remove the meat off the bones. Shred the meat into small bite size pieces. Add the garlic, salt and pepper to the chicken. Combine well. Strain the broth and remove the excess fat. 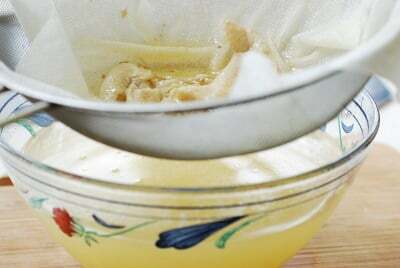 You can line the strainer with a paper towel or use a fat separator. Return the broth back to the pot. Add the optional dried kelp, onion slices, and soup soy sauce. Bring it to a boil and boil for a few minutes. Add salt and pepper to taste. Remove the kelp. 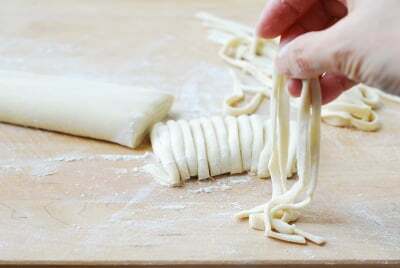 This is a good point to roll the dough out and make the noodles if making homemade noodles. 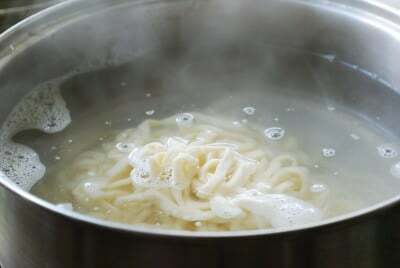 Meanwhile, in another pot, boil water to parboil the noodles. Add the noodles, and stir. Cook briefly. Remove the noodles with a strainer and add to the pot with the broth. Continue to boil until the noodles are cooked through. 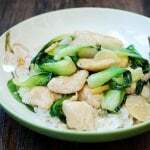 To serve, ladle the noodles and soup in a serving bowl, top with the chicken pieces, zucchini, and chopped scallion. Mix the flour, salt, oil and water by hand until the dough comes together. Generously flour the surface to knead. Knead with the heel of your hand until the dough is fairly smooth, about 7 to 8 minutes. The dough should feel slightly stiff. You can adjust the dough by kneading in a little more flour or more water (just enough to wet your hands). Cover with plastic wrap, and let it rest for 30 minutes to an hour. 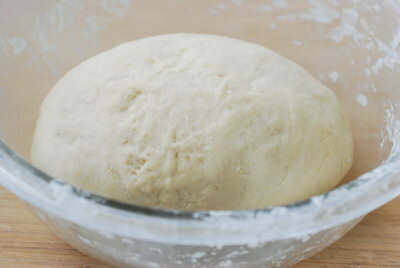 After resting, the dough should feel soft and smooth. You can prepare the dough up to this point a day in advance. When ready to use, knead the dough for 2 to 3 minutes. 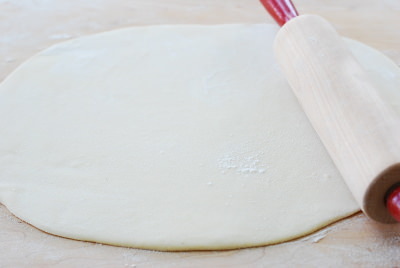 Using a sharp knife, cut the dough into 2 pieces. 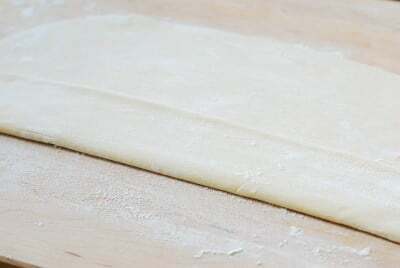 Flatten a piece, and roll it out with a rolling pin to make a thin sheet, about 12 x 14-inch. From the longer side, fold the dough over 3 to 4 times into layers. Generously flour the surface, and the dough as you roll it out and fold to keep the dough from sticking. Cut the dough with a sharp knife into about 1/4-inch thickness. 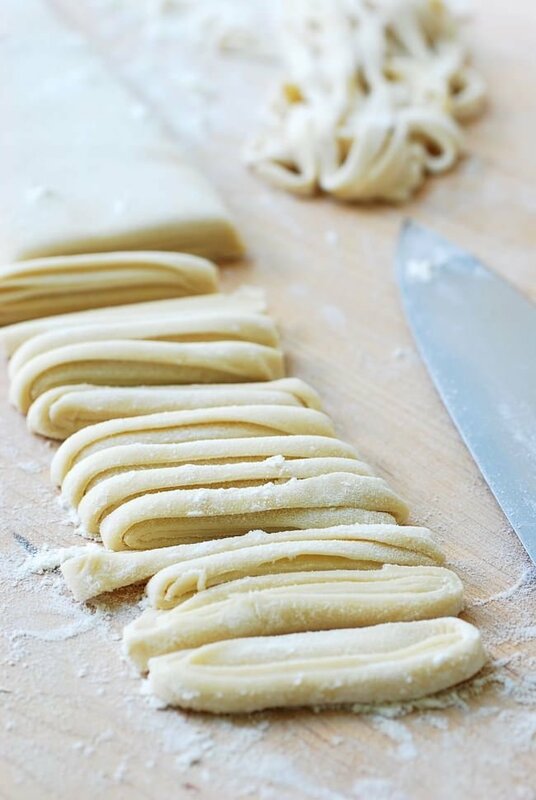 Unfold the noodles and dust with flour to keep the noodles strands separate. If you want make noodles for 2 to 3 servings, use 2 cups of flour, 1/2 teaspoon of salt, 2 teaspoons of oil, and 2/3 cup of water. Basically, the ratio is, for every cup of flour, you will need 1/4 teaspoon salt, 1 teaspoon oil, and 1/3 cup of water. What sort of flour do you use to make the noodles? All purpose flour. Hope you try it. Hi there (≧∇≦)/ i just wanted to check if the Yangnyumjang is used to dip the noodles in while eating or do you put it directly into the soup? Thanks! Usually directly put into the soup. Thank you so much for adding the PDF feature! It makes things a lot easier! My pleasure! I love it too. It looks much better. Thank you for leaving me a note about it! I found this today looking for something new to do with Thanksgiving leftovers. I can’t wait to try making the noodles. Hello, this looks very good! Is the sesame oil in this dish toasted or regular? Can you use the banjuk to make sujebi? Or is the recipe for sujebi banjuk different? It’s the same. You can make it slightly more wet for easier pulling. Sujebi sounds so good right now. I should make it soon too. Enjoy! Great! Happy to hear you son loves it.